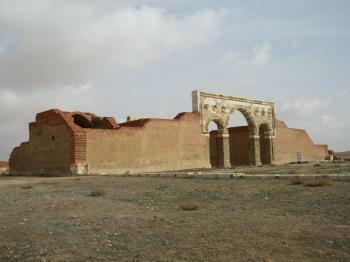 Qasr Al-Mushatta is part of the Tentative list of Jordan in order to qualify for inclusion in the World Heritage List. The site is located very close to the Ammann airport, so for visitors renting a car there (very recommended for Jordan) it may be the first spot. The site is not very popular, so there are few tourists, no fee and no guards or other personnel. Qasr Al-Mushatta is a quite well preserved ruin of Umayyad palace from 8th century. It served as a khalif's palace and from what remained one may realize that it was really magnificent. Main construction of the palace survived, but nothing but naked walls remains inside. Beautiful facade of the palace was mostly disassembled and moved to Berlin, where it can be admired in famous Pergamon Museum. Qasr Al-Mushatta is an easy site that can be visited very quickly. Definitly worth a detour.